Arora is a lightweight cross-platform web browser. It's free (as in free speech and free beer). Arora runs on Linux, embedded Linux, FreeBSD, Mac OS X, Windows, Haiku, and any other platforms supported by the Qt toolkit. 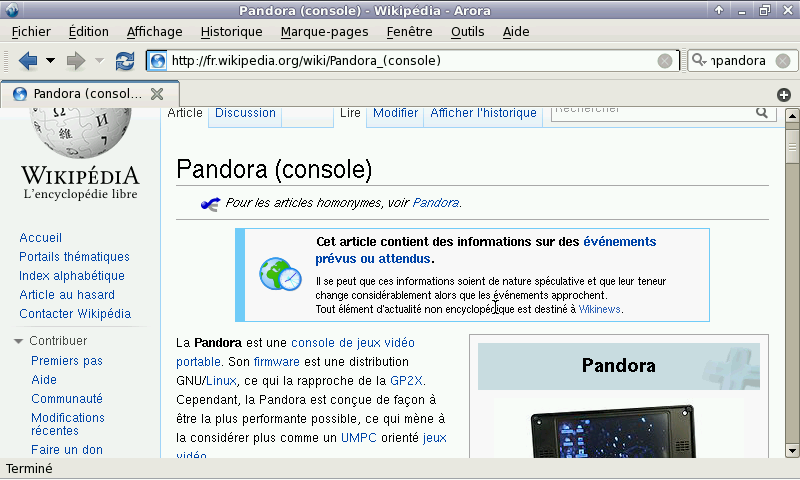 Arora is a simple and quite light Web Browser based on QtWebKit. Note: Disable AdBlock to make it start faster. * Corrected fileassociation so filename containing space can be launched. * Another attempt to fix SSL Certificate warning. * Corrected the dirty hack in Adblock so it can be re-enabled once disabled (and vice-versa). * Higher def icons (60x60 now). * Added File Association for Firmware 1.54+. Even though this version of Arora is a bit old, out of all the non-Links browsers I've tried, it works the best on my classic Pandora. Cool. Do you have a git repo for arora? I wouldn't mind having a go at those pesky dialogs myself. As I updated from QT4 to QT5, I'll try another build soon. When my laptop died, Firefox and QupZilla could not handle my typical usage pattern (lots of tabs) while staying usable. 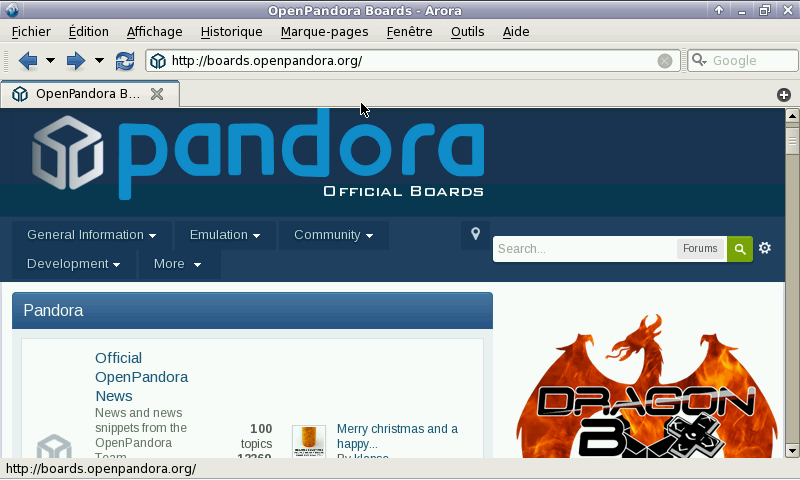 Arora made it possible to use my OpenPandora (original) to search for a replacement laptop. I did hit a few bugs, but it is much more stable than Chrome and Midori.